... it's got groove, it's got meaning... Verve is the time, is the place, is the motion, and Verve is the way we are feeling! I made that one expressly with my DH in mind. Last weekend while we were in Las Vegas, he went to the trouble of arranging for us to see LOVE, the Cirque du Soleil's homage to The Beatles because he knew I'd love it. And he only looked at his Blackberry a couple of times during the performance; that's HUGE progress, people! Next is one of my new favorite sets -- Asian Flair. I love the patterning possibilities with this one and look forward to playing with it often. Just a simple long-note, but the sentiment combined with that great Impression Obsession image, it lets the recipient know the whole flock is with her. There's also the upbeat "All About You" sentiment set, which expresses feelings like "You're the best thing that's ever happened to me," or "What would I do without you?" And isn't this next one a fabulous way to say "Have a nice day"?! Last but not least, Verve's introducing a new collection of individual stamps called 'Plain Janes' because they don't have a printed index on the acetate. This first one is a Bible verse from Psalms 37:4. Right now through July, you can get the entire June Verve stamp collection -- 4 sets = 37 stamps (doesn't include the Plain Jane) -- for only $42! Dang! Julee's practically giving 'em away!!! At a price like that, you simply can't afford to NOT get your Verve on! If you're still not convinced, by all means head on over to the Verve Gallery and see what the other fabulous Verve Design Divas have come up to show off the new polymer. It's a feast of Class Act stampin'! And you can also find the recipes for each of my cards there, as well. Now, I need to go rest after all of this sharing! Another Bee-utiful Sketch For You To Try! A month or so ago, I wrote of how much I like images of bees and beehives. I was rattling on about this fact in a thread discussion earlier this week, and was led to a card that used this gorgeous stamp by Impression Obsession. Which I had. Which I had not yet inked. Do you ever do that? Buy a stamp you just love but are too busy with other projects to use right away, then see it somewhere and say to yourself "oh, yeah!" So I became bound and determined to use this image for this week's SFYTT. The illustrator is a lady name Leigh Hannan, and ever single one of her images is to die for. They're very detailed and fancy without being too frou-frou, you know what I mean? I really wanted to do it justice, so I blinged it up with lots of tiny Swarovski crystals and each bee was stamped twice, then cut out and popped up with Dimensionals. The honeycomb paper was created by spreading ink from a gold ColorBox Pigment Brush Pad directly onto a Fiskars Texture plate, then running it through the Cuttlebug with a piece of water-misted So Saffron cardstock. I don't know if you can tell from the picture, but I used gold thread to machine stitch around the image. This uses Jen's latest Sketch For You To Try, which you are definitely going to want to print out -- it's an especially great one, I think. When you visit Jen's blog for the sketch, be sure to see what she and her Guest Designer Toni Whitnell made, then buzz on over to Amy, Shannan & Susan's for more yummy creations to whet you creative appetite and get those stampin' juices flowing. And when you upload to your SCS gallery, be sure to use 'SFYTT' as one of your keywords so we can check out what you made. It's a gorgeous day here in Oklahoma -- I think DH and I are going to try to find a sitter and head over to MayFest. We haven't done that in YEARS! It's almost kinda like a ... dare I say it?!... DATE!!! Hmmm... Do you think I'd better shower? Okay. Well, then I'd better quit chattin' and start soapin'! I hope your day is full of good, clean FUN! Supplies used -- Stamps: Beehive by Impression Obsession, sentiment by A Muse; Paper: Aqua Mist, Summer Sunrise, and Everyday Blessings patterned paper by PaperTrey Ink, Georgia Pacific White, So Saffron (SU! ); Ink: Brilliance Archival Graphite Black, ColorBox Pigment Brush pad in gold; Accessories: Copic Sketch & Spica markers, sewing machine, gold thread, Swarovski crystals, Dimensionals, Bella Baubles, ribbon, Fiskars Texture Plates. Sweet & Sour Sketch For You To Try! Isn't that lemon image amazing?! I first saw these incredible stamps in the Impression Obsession booth at CHA and immediately fell in love. While blurfing last week, I visited Julie Koerber's blog (which is gorgeous, by the way -- be sure to check her stuff out) and was reminded that I had some shopping to do. And now, one week later -- behold! This is just one of several lemon images that I *had* to have. I love lemon-flavored anything -- lemon drops, lemon meringue pie, lemon squares, Limoncello, etc. One Mother's Day, Truman even gave me a great cookbook called Luscious Lemon Desserts; yum! And the motto "When life gives you lemons, make lemonade" is definitely one of guiding principles. So me and these lemon stamps? A match made in lemon heaven! This week, Jen's Sketch For You To Try has a circular focus. 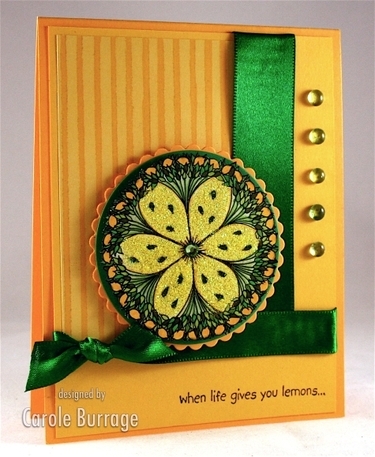 You'll find the sketch and samples by Jen and her March Guest Designer, Joanne Basile, on Jen's blog. And be sure to visit Shannan, Susan, and Amy to see their interpretations. My Saturday morning ritual is playing with this sketch first thing in the a.m., posting it here, and then racing to the rest of the gals' blogs to see what they've done. I'd love to see what you do with this sketch, too, so if you have a chance to play with it and upload it to your SCS gallery, be sure to use "SFYTT" as one of your keywords. Hopefully the ability to leave comments here has been restored or will be shortly. I'm sure it will be soon because Typepad typically has really good customer service. I know thousands of you are chomping at the bit to type all sorts of compliments to me, and heaven knows I'm in the mood to read them. In the meantime, I've got plenty to do -- next week is going to be a busy one. On Tuesday: The Cat's Pajamas starts a fun new feature I think you're all going to enjoy, I get to share my BIG news (! ), and I've got some April Fools' pranks to pull (imagine that...). And on Wednesday, there's the My Favorite Things New Release Cocktail Party. So much stamping goodness in one week; I don't know if I'll be able to stand it!! Supplies used -- Stamps: image by Impression Obsession, sentiment by Rubber Soul; Paper: Yo-Yo Yellow and Summer Sun cardstock by SU!, Georgia Pacific White, patterned paper by Creative Memories; Ink: Brilliance Archival Graphite Black, SU! Basic Black; Accessories: Copic Sketch & Spica markers, ribbon, Swarovski crystal, grass Bella Baubles, Nestabilities, Art Glitter, Dimensionals.